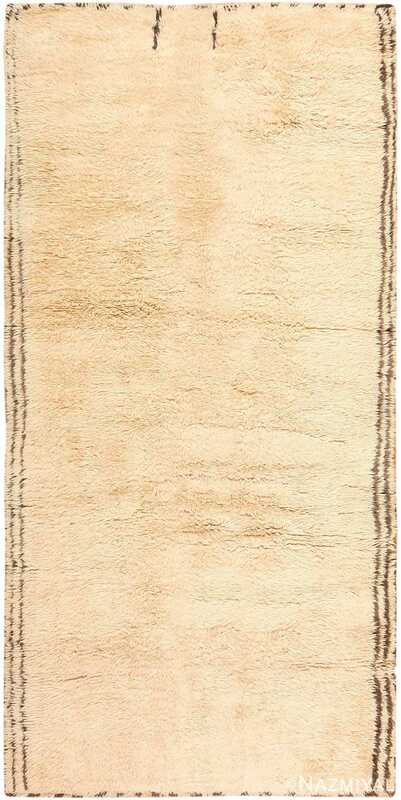 Shag rugs, as their name implies, are rugs with a shaggy or woolly feel and appearance. 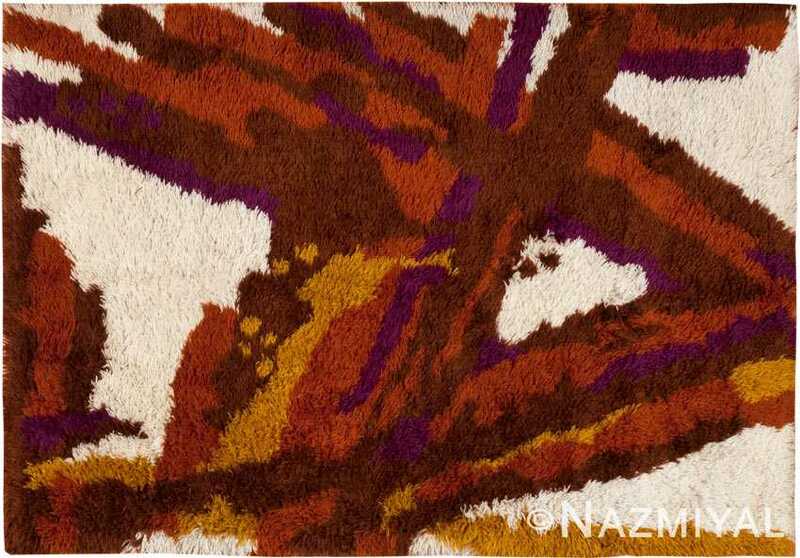 Modern shag rugs are dense carpets made with materials such as silk, wool, and cotton. 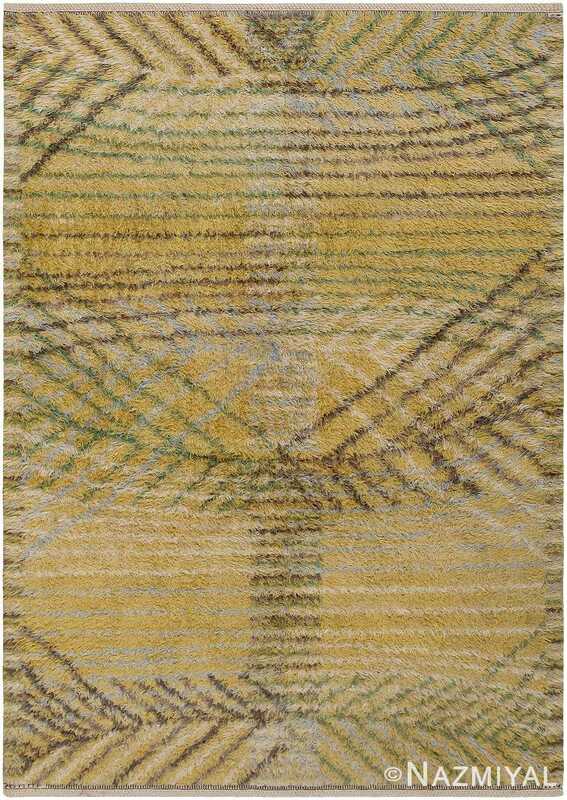 These trendy carpets are characterized by a funky fashion. However, some argue that the creation of shag carpets can be dated as far back as 331 BC. In the days of Alexander the Great in ancient Greece. 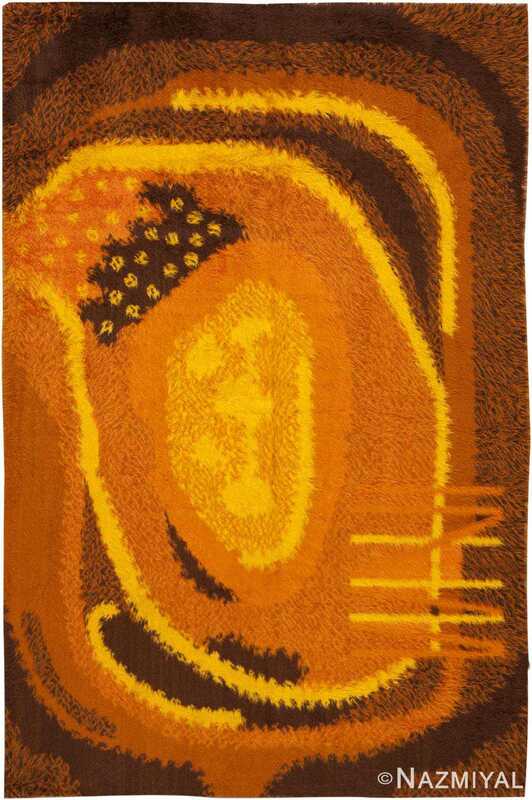 These shag rugs were called “Flokati” rugs and were handwoven from goat hair. They were popular throughout Turkey and Central Asia as a decoration for royal palaces. 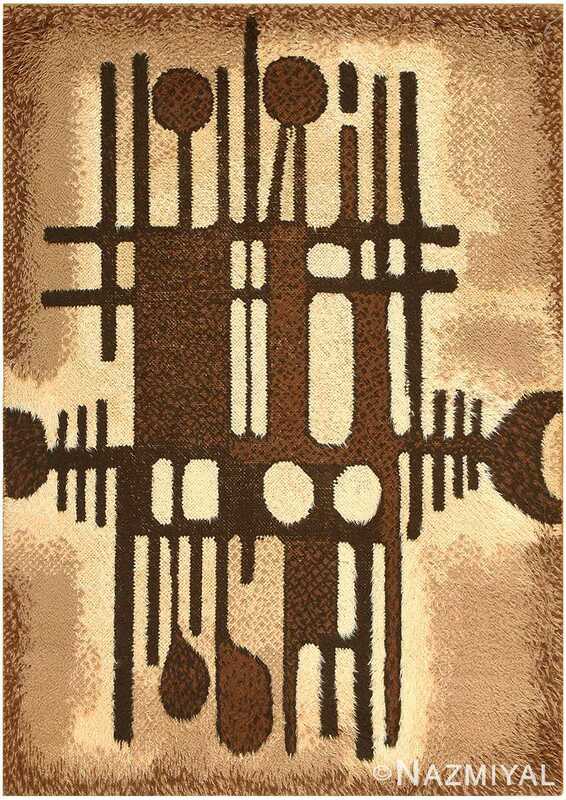 The mid century vintage shag rugs, which are quite different from their modern rug equivalents, are luxurious and ornate carpets with more complex, personal, and unique designs. Once the shag rug appeared in the Brady Bunch show, they saw an astounding increase in popularity and demand. Propelling this fascination, of course, were the experimentation vibes of the energetic mid 20th century era. Authentic shag rugs would prove to spice up the common style with a whole new matted touch, exposing a novel genre of art and interior design. However, the shag carpets that were popular during this decade of disco pazzazz and hip-hop vibes were generally characterized by solid colors of soft shiny material. 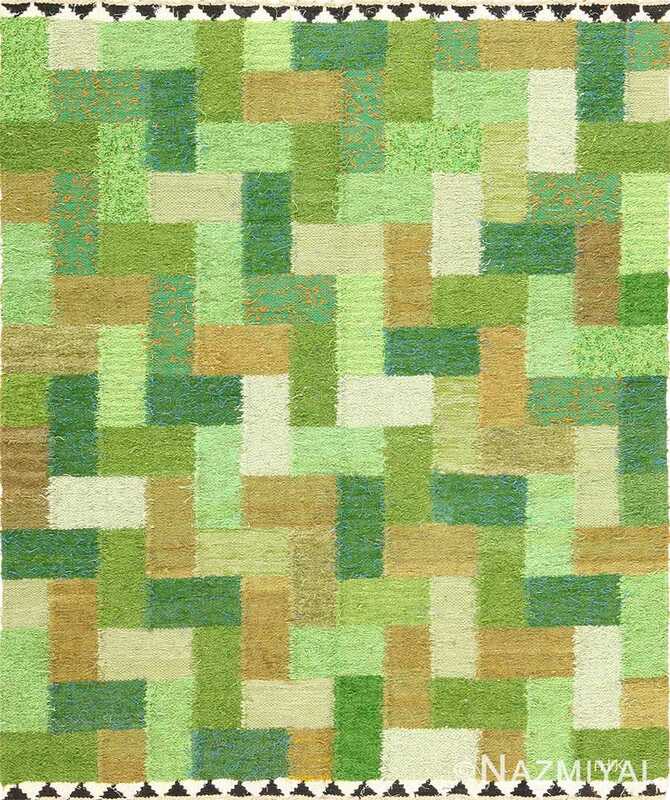 Of course, the style and materials used in shag rugs depend on the country of origin. 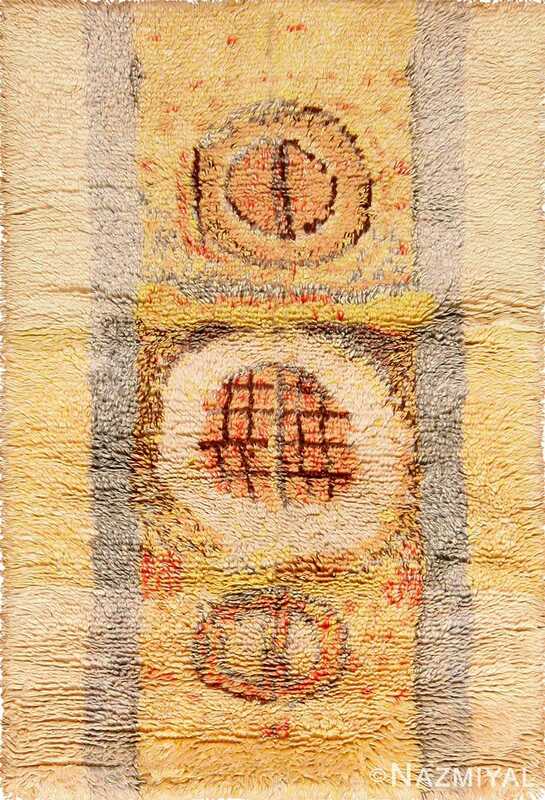 For example, more personal and unique folk art qualities are apparent in Moroccan shag rugs, which are prime showcases of vintage mid-century rug design aesthetics. 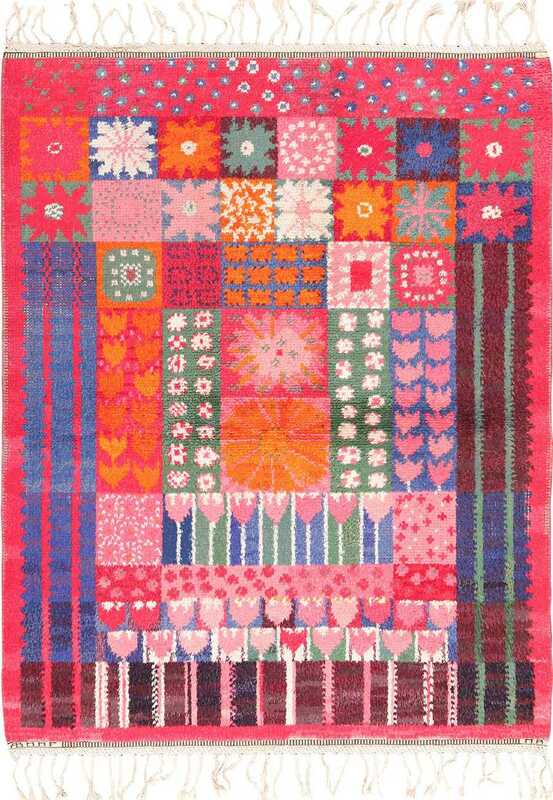 The folk art rug style of these rare carpets is responsible for the wide variety of rug styles, patterns, textures, and imagery. 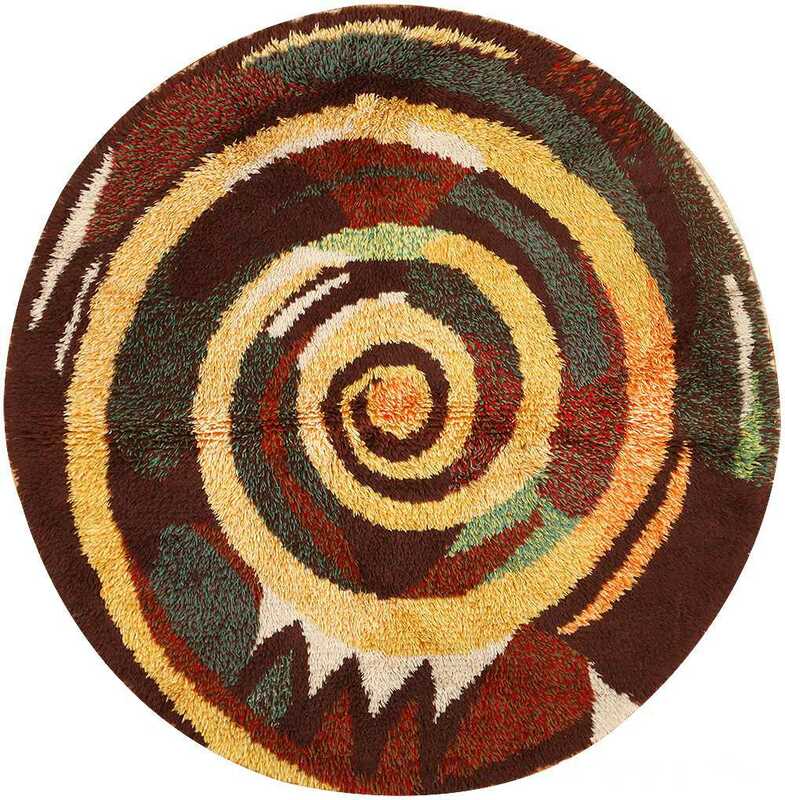 This special category of shag rug design is known for its bright, bold, and tribal colors as well as more subtle hues and designs. 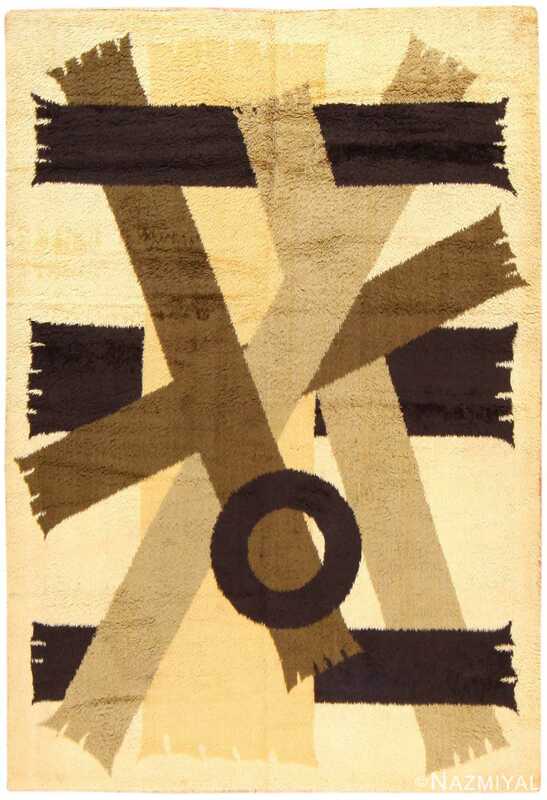 One Moroccan shag rug could have bold geometric shapes with vibrant colors and tasseled edges while another might contain a unique and simplistic combination of abstract brown lines drawn across an ivory background. Due to their increasing popularity coupled with their wide range of colors and patterns, authentic Moroccan shag rugs are becoming increasingly harder to find. 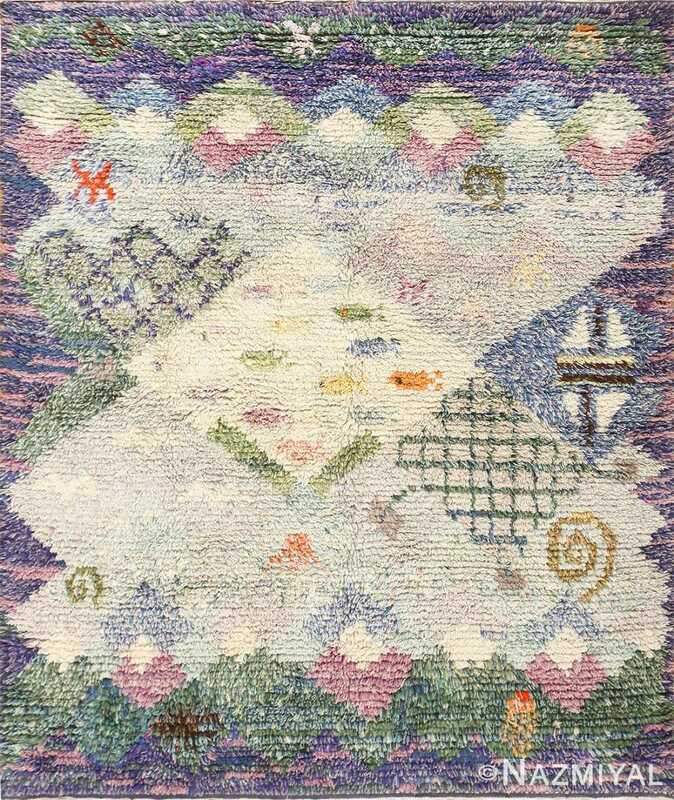 Another type of shag rug are the vintage Swedish Rya rugs. 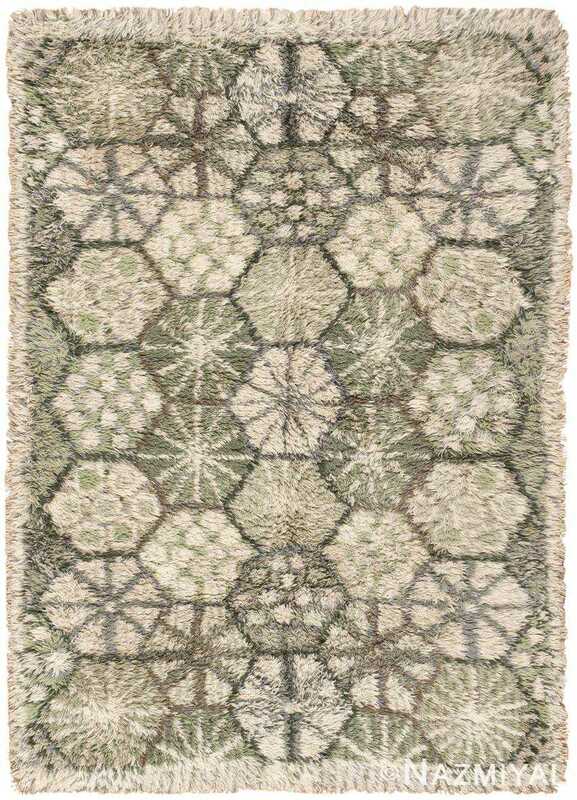 These beautiful Scandinavian rugs will tend to have more geometric art deco influences designs. 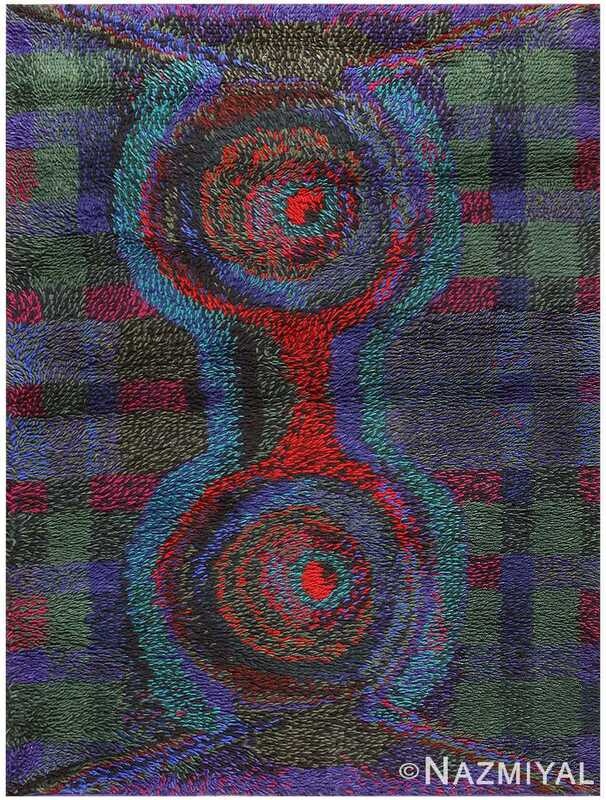 These rugs are some of the more artistic and exciting shag rug examples. Unlike other shag rugs that scatter the modern market, vintage shag rugs have the ability to add an irreplaceable charm to interior design settings. These exciting and dynamic vintage mid century carpets are truly beautiful works of textile art as well as decorative home pieces. Their beautiful plush and luxurious texture and patterns add both tactile comfort and visual dimension to any space. 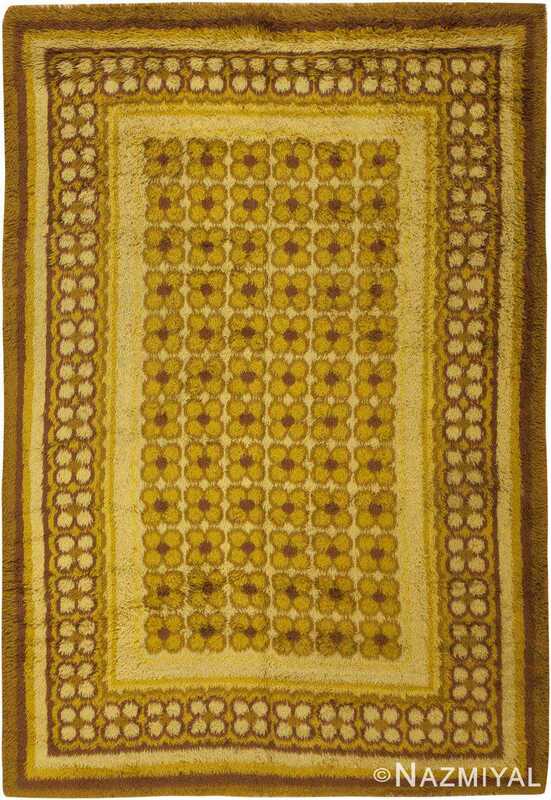 This stylish vintage Moroccan rug has a luxurious facade with minimalist decorations that show exactly why local weavers are known as masters of understatement. Intriguingly quartered yet otherwise conventionally composed, this thought-provoking Moroccan carpet is a fascinating example. 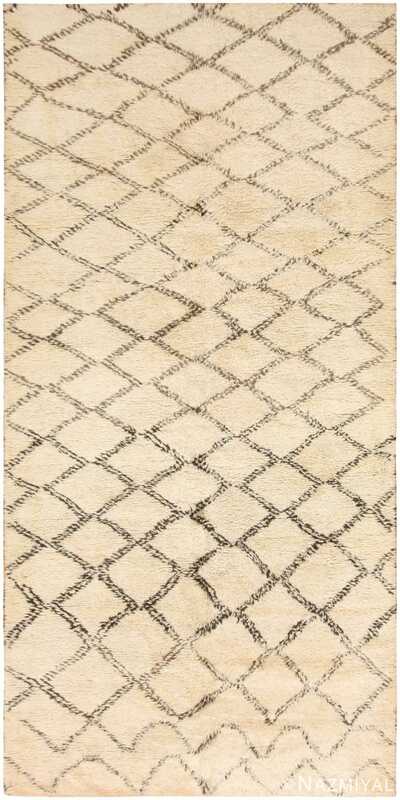 This superb vintage Moroccan rug depicts a stark, unadorned facade with rich textures and subtle embellishments that take minimalist designs to new heights. 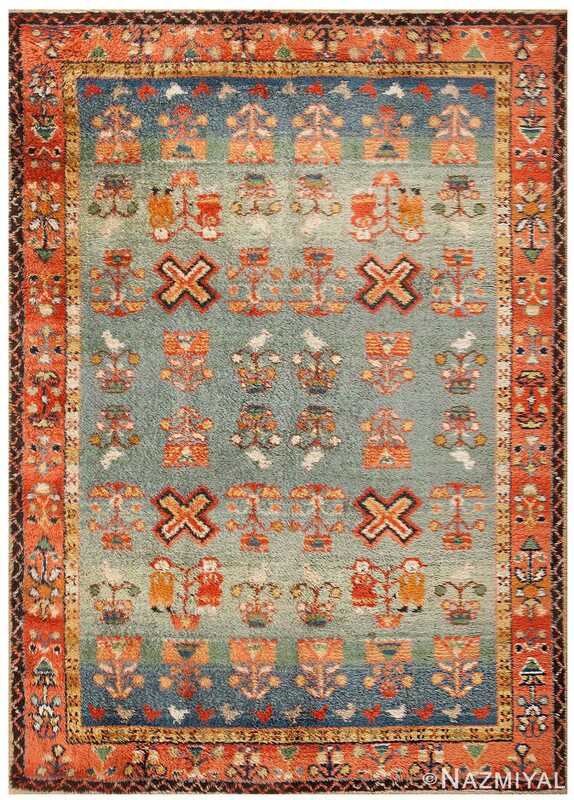 This spectacular vintage Rya from Scandinavia features an abstract medallion incorporating sweeping lines and formal shapes rendered in saturated colors. Formal florets surrounding central coronas create a charming flower-filled field and decorate the radiant borders of this warm golden-brown Rya from Scandinavia. Crafted in the mid-20th century, this luxurious vintage Scandinavian rya showcases a fantastic minimalist pattern with graphic linear motifs and op-art tendencies.